REDDING, Calif. – Julie Bass Kaplan, a Bachelor of Science in Nursing (BSN) graduate at Simpson University, has been selected by the Western Institute of Nursing (WIN) to present her poster at the 45th Annual Communicating Nursing Research Conference in Portland, Ore., on April 20. The WIN conference brings together a diverse community of nurses to advance nursing science and to create a forum for the exchange of scholarship and research. 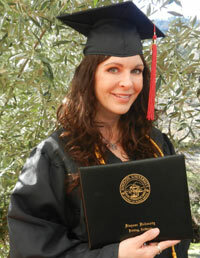 Kaplan, who graduated with honors, was among 184 other graduates during Simpson’s winter commencement on Jan. 21. Kaplan’s research topic, Kids Using Technology to Teach Kids Healthier Eating Behaviors, was prompted by her community/public health class at Simpson University. Kaplan said it was her professor, Julie Gee, who encouraged her to submit the research to WIN. Gee said that as a student, Kaplan was always prepared, engaged, and supportive of fellow students. Kaplan thought about earning her BSN for a while and even considered other universities outside of Redding, but the drive was too far for her. When her youngest child was 9 years old, the 44-year-old mother of three decided it was the right time to return to school and that Simpson’s ASPIRE program was the right fit for her. During her 16 months in the ASPIRE program, Kaplan continued to work full-time. Since 1999, she and her husband Jory have owned the Disappearing Act Cosmetic Laser Center in Redding. 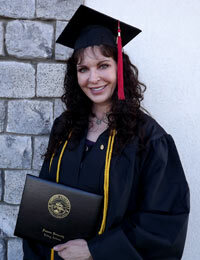 Earning her BSN allows her to continue on to receive a Doctorate of Nursing Practice, something she’s wanted to do for some time. “As a nurse, I often see patients with suspicious skin lesions, but all I could do was encourage them to see a dermatologist. I wanted to continue my education so I can provide a more thorough assessment and perform skin biopsies for our Redding patients,” she said. While in the ASPIRE program, Kaplan said she was impressed with how respectful Simpson professors were of different faiths. Kaplan said the ASPIRE program inspired her to think about her role in the community.